Where to Use Sliding Door Systems? Sliding doors can be used to create extra space in the home, allowing for more space and light to enter dark and cramped rooms. By converting hinged doors to sliding doors, you can typically save 1 metre of space, with the need to leave space for the door opening no longer necessary. These are the most commonly used of all the sliding door systems, allowing the doors to slide easily using the mechanism on top of the hung doors. The system involves using trolley hangers at the top of the door, running in a concealed track. The door is hung at two points, with additional guides required at the bottom to ensure the door stays in place and doesn’t swing forwards and backwards. To ensure the doors don’t come loose from the track, safety locks are used to keep them in place. Dampeners and soft closers can also be used as additional protection. In comparison to top hung doors, bottom rolling doors work using a bottom sliding mechanism. Two rollers run along the track which allow the doors to slide, while guides are also positioned at the top to stop the doors from swaying. Pocket systems can be hung at the top or be bottom rolling and work using a pocket system in a wall compartment for the doors to slide into. The effect of the system makes it look as though the doors have disappeared into the wall, which is ideal if you don’t have a lot of space to work with. Where to use Sliding Doors? Bespoke sliding doors can be used for a wide range of reasons in a variety of applications, from medical and commercial, through to residential and educations. Let’s take a look at the different places where sliding doors can be used. Bedrooms can often be dark and dingy with a lot of furniture that consumes space and contributes to the lack of light. To create more space and enhance the lighting in your bedroom, sliding doors should be considered. 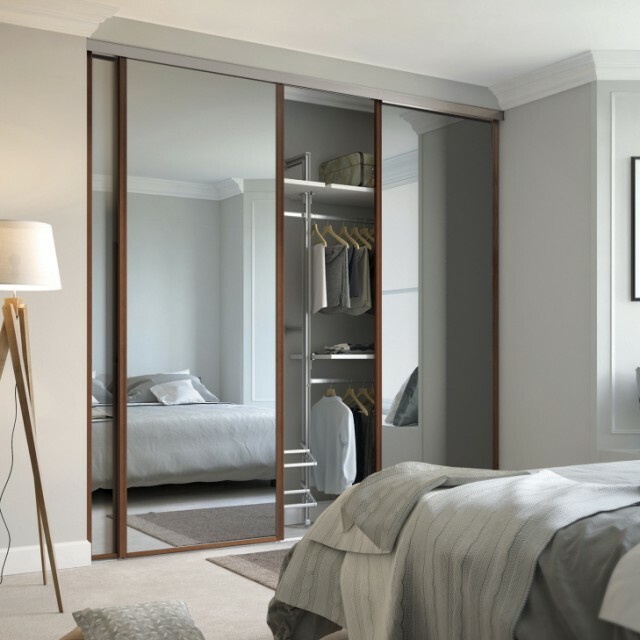 Sliding doors can be more aesthetically pleasing in hotel rooms for en-suite bathrooms and wardrobes, saving space throughout the room to allow more light to flow through. The first thing that probably springs to mind when you think of sliding doors will be a sliding wardrobe, used for clothes and other general storage in bedrooms at home. Sliding wardrobes make it possible to have large, practical and convenient storage units for clothing and other personal belongings, with shelving, drawers, hanging rods and partitions all available to help keep the wardrobe tidy. Sliding doors don’t have to be limited to wardrobes in the bedroom and can be used for other cupboards and storage units throughout the home. Sliding Robes Direct is one of the leading choices for sliding wardrobe doors, offering a range of doors and storage solutions that can be purchased online. Sliding doors have versatile characteristics, with the way they are hung and the ways they can be used. Because of this, they are often a popular choice is educational establishments such as schools, nurseries, colleges and universities. As well as providing extra storage in certain scenarios, sliding doors can be used as blackboards/whiteboards to help aid teaching. One of the best methods for covering up unsightly appliances, such as washing machines and tumble dryers, is to hide them within cupboards or behind doors. Sliding doors can come in very handy to keep these types of appliances and furnishings hidden from immediate view. They can also help to save space in kitchen and laundry areas, where there may not be much space to have a hinged door installed. One of the problems faced by disabled people is doors that open inwards and outwards, often making it difficult for them to maneuver themselves through. Sliding doors are one of the most practical door types for disabled access, with an easy-to-use sliding mechanism that also helps to reduce space. Archway Joinery can provide a wide range of bespoke door solutions for different applications. If you want top hanging, bottom rolling, pocket doors or doorsets, we can design and manufacture your doors for you. Call today if you are interested in having bespoke doors tailor-made.